Happy Hamby Campers: Thought bubbles! In January 2009, when Nick and I bought our first tents, I had little experience of that style of camping. 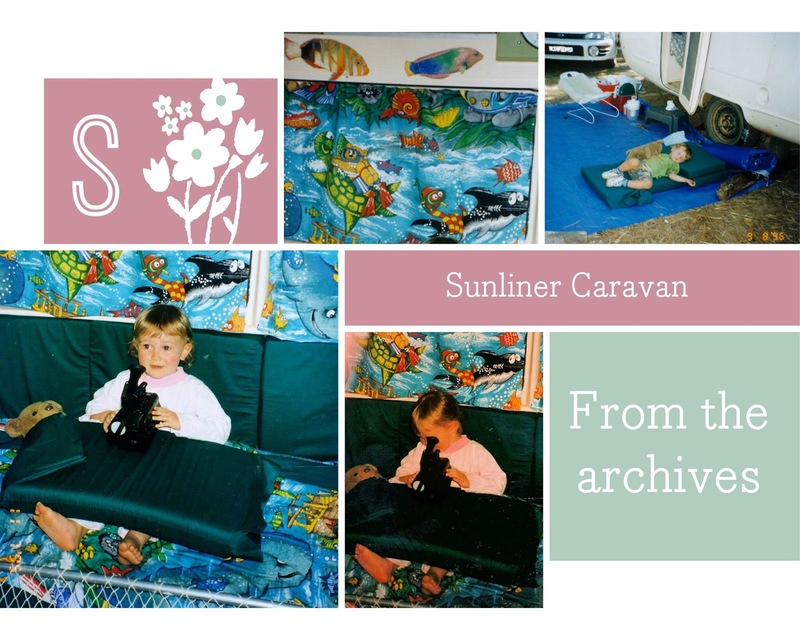 I actually had far more knowledge of caravanning (both as a child and later, young mother). I'd also lived at various times in places with limited facilities, so felt I could cope with camping (which was the limit of our budget at the time). Luckily I was right! I've previously written of the large van my family lived in. 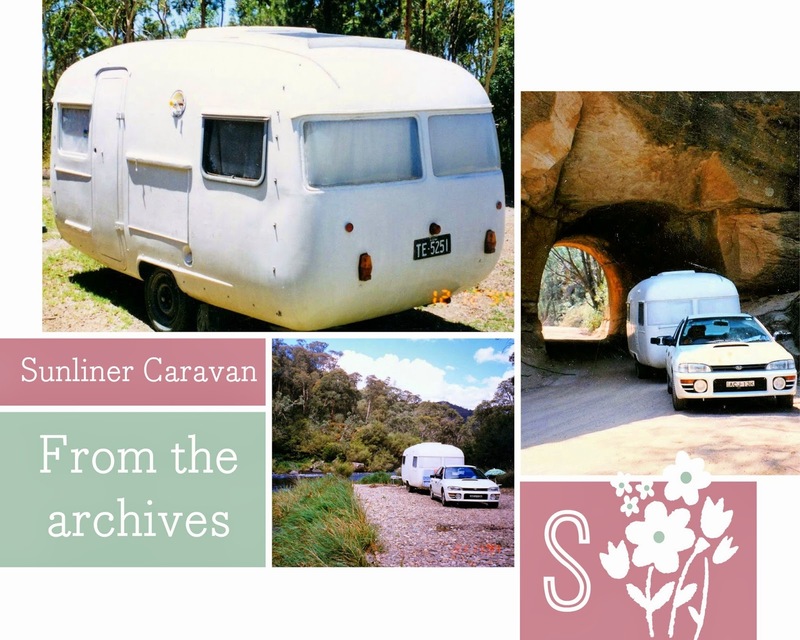 When I was around 7 or 8, my parents sold their holiday cottage accommodation business on the NSW South Coast and bought an F100 and 25-foot Viscount Supreme caravan. We were set for a round-Australia adventure! (First stop was Yowah where we stayed for a long time, arranging the sale of the shack and mining lease). Scroll forward to 1994 or thereabouts. My then-husband and I bought a bargain fibreglass bubble caravan and set about renovating it to better suit our needs. Vintage vans were not so popular back then. Our main criteria had been cheap and light-weight, rather than "vintage". The Sunliner van we purchased had an interesting history. It's previous owner had been a missionary and travelled to remote Aboriginal communities. He intended to create a window in the side of the van, so as to perform puppet shows as part of his preaching! We never met him but did marvel at the many secret nooks in the cupboards! I enjoyed choosing a colour scheme, then crafting new curtains, custom bedding and other items for the caravan. I had the most fun creating a "room" for my older daughter at one end of the van. Soon after her sister was born, we all set off on a three-month extended holiday through the Northern Territory. That van was around half the length of the larger one I'd lived in as a child. The fabulous fish "room" was at the rear. The front dining area was converted to a permanent double bed - and my baby daughter slept in a bassinette on the floor! I cooked outside, using a 2-ring gas burner stove. We dined alfresco, utilising an oval plastic table (that rested on top of the front bed while in transit). Fortunately we travelled during the dry season as I don't remember any gazebo or other cover. Generally we stacked as much stuff as we could outside the van when it was stationary. Whenever we set up at camp, it was like opening Mary Poppins' carpet bag! What has prompted this ramble down memory lane? I've been thinking I'd like a caravan. Nothing super-flash. Definitely small. Probably "vintage" due to (at this stage non-existent) budget! Why do I want one? Since returning from Yowah, Nick's work hours have changed. He no longer works shift-work, which means he is home every weekend - and it may be possible to use that time for short trips. We're also pondering a set-up that would enable us to camp throughout the year, regardless of colder temperatures. All just thoughts at this stage but I'm enjoying looking at what is available and what renovations others have done. There are some very clever people out there!